I never knew that different ducks would taste differently until I met Hank Shaw. Apparently ducks that eat only seeds and greens will taste entirely different from those that eat bugs and fish. It was a conversation I remember as I was immediately taken and impressed by this local treasure. 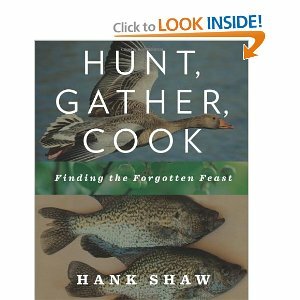 Yes, I feel we Sacramentans are lucky to have Hank Shaw in our midst as a valuable resource and champion for eating back to our paleolithic roots - hunting and gathering. Unfortunately I've only ever met Hank three times. We're both busy people, but Hank is especially hard to catch because he's out and about the landscape and the country doing what he does. Last year he was traveling around the country on his book tour for Hunt, Gather, Cook: Finding the Forgotten Feast. This successful and well reviewed book covered - you guessed it - hunting, foraging, fishing, and cooking. He was able to publish the book after years of success and two James Beard nominations for his blog, Hunter Angler Gardener Cook. Hank prices the tour at $45 which includes a copy of his book and a lunch! He made us a green minestrone that had cow parsnip, nettles, and fennel with some pesto with wild pine nuts. I won't cover in detail what we learned because, honestly, it's Hank's expertise and you should go on his walks yourselves. Here are just a few pictures with some notes to entice you. A lovely, lilac Blewit mushroom. Mushrooms are often found around the refuse at the roots of oak and pine trees. Be VERY careful and consult mushroom guides before you pick and consume wild mushrooms. Last thing you want is a liver transplant! 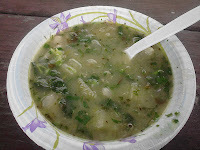 To find out about when and where his upcoming foraging tours will be, follow Hank Shaw on Twitter or his Facebook page.